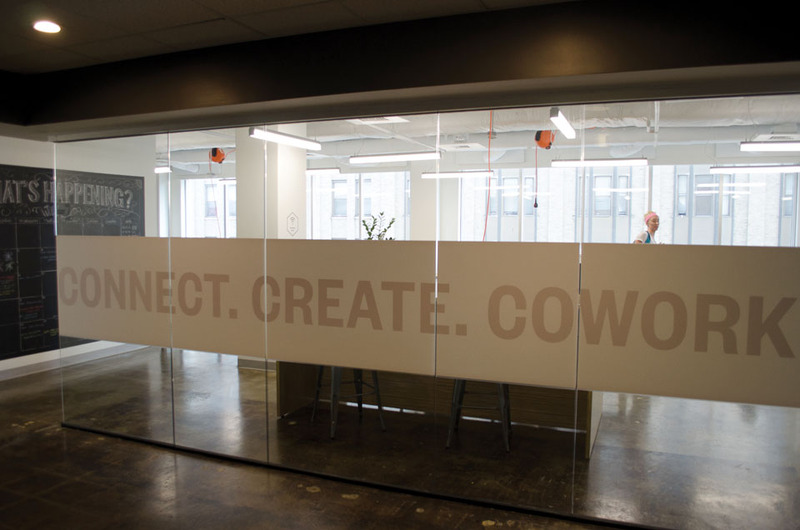 Located on the sixth floor of the Edney Innovation Center, Society of Work offers professionals and companies shared workspace among a community of fellow innovators. By 2013, the work of the Gig City Initiative and its partners had helped to not only launch the fastest internet in America, but also re-establish Chattanooga’s reputation as a destination for innovators, makers, and thinkers. Further advanced by the Chattanooga Forward initiative, the city that more than a century earlier was described as “feverish” with entrepreneurial excitement was once again beginning to attract young entrepreneurs—this time focused on technology. When Chattanooga Mayor Andy Berke was running for office in 2012, one of the first groups he met with were leaders in the technology industry. Despite the swell of attention garnered with the announcement of the Gig and the initiatives that directly followed, they were afraid the momentum would die. Chattanooga was sitting on a gold mine and had only just begun digging below the surface. After devoting much attention to the city’s high crime statistics during his campaign, Berke spent his first several months in office reorganizing city administration and tackling public safety and education concerns. Advancing Chattanooga’s entrepreneurial and innovation economy was still a priority but took a back seat to the issues he had touted as part of his campaign until the end of the year. Then in December 2013, Berke announced Chattanooga Forward, a community visioning initiative taking aim at improving quality of life through the scope of six focus areas: Sports & Outdoors, Entertainment and Attractions, Housing, Downtown, Arts, and Technology, Gig & Entrepreneurship. Task forces comprised of community, public, and private sector leaders organized around each focus area, and a series of public meetings provided Chattanooga residents an opportunity to help shape long-term goals for the city. Within the framework of the Technology, Gig & Entrepreneurship Task Force, community leaders issued several recommendations, including the creation of a central entity to lead the city’s efforts in maximizing the growth of its innovation economy. The solution to this void came in the form of an already existing organization, The Enterprise Center. Through The Enterprise Center, the city would tackle the focus areas prioritized through Chattanooga Forward, beginning with the creation of a physical innovator-friendly community near the city’s center. Climbers scale one of the rock walls at High Point Climbing Gym in downtown Chattanooga. 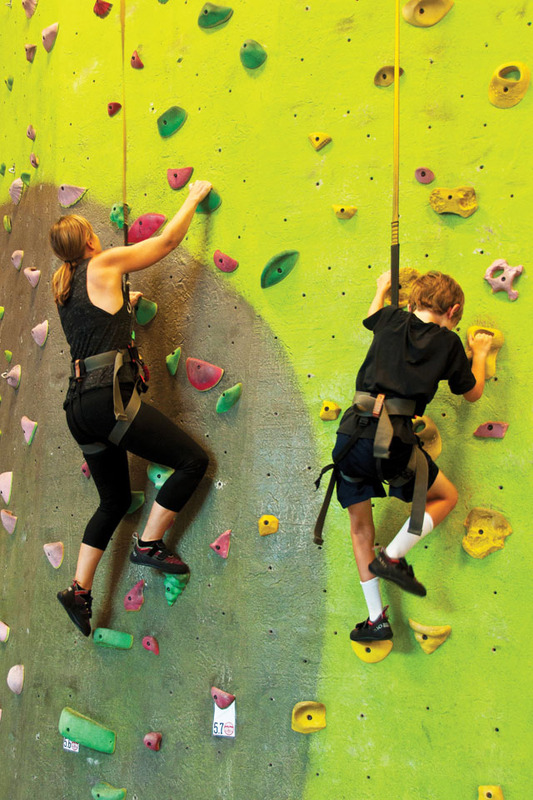 One of the largest of its kind in the country, the unique gym features an outdoor wall visible from the bustling street below. One of the first recommendations from the Technology, Gig, & Entrepreneur Task Force that came to fruition was the creation of an Innovation District. It was a concept that Berke had explored prior to Chattanooga Forward and, until its inception in the Gig City, had only been adopted in large metropolitans such as Barcelona, Seoul, Boston, and San Francisco. Interestingly, perhaps the earliest example of the Innovation District can be found in the heart of what is now a worldwide attraction: Disneyworld. When Walt Disney conceived the Experimental Prototype City of Tomorrow (EPCOT), he said it was to “take its cues from the new ideas and new technologies that are now emerging from the creative centers of American industries.” A showcase of the best and most creative aspects of American free enterprise, EPCOT was to be anchored by an urban hub and surrounded by areas of business and commerce, high-density housing, recreation areas, and neighborhoods. Disney died before his plans could be realized, and his successors instead scaled back the project into a futuristic global theme park. Though many Innovation Districts have been in existence since as early as the year 2000, the term gained widespread traction through Bruce Katz, Centenial Scholar at the Brookings Institution, and his 2013 book Metropolitan Revolution. In it, Katz and co-author Jennifer Bradley describe the rise of high-density metropolitan enclaves driving sustainable economic development through the co-location of innovative companies and start-ups, business accelerators and resources, co-living and recreation spaces, and proximity to educational and research institutes. “Innovation districts are the manifestation of mega-trends altering the location preferences of people and firms and, in the process, re-conceiving the very link between economy shaping, place making and social networking,” Katz and Bradley write. Berke elaborates on the concept, pointing to the ability of Innovation Districts to create opportunities for diverse people to converse, debate, and otherwise interact in meaningful ways. Located downtown within a quarter-mile radius of the intersection of Martin Luther King Boulevard and Georgia Avenue, Chattanooga’s 140-acre Innovation District looks a lot like it did before the vibrantly colored banners and street sign plaques went up officially designating it as such. To the average passerby, it looks like any mid-sized city’s business district: late 19th-century industrial buildings that have been reimagined as office, government and retail space, intermingled with newer developments of the 1980s and ’90s that emphasized function over form; an assortment of restaurants and cafés; and a handful of city open spaces. But despite the seemingly ordinary exterior, the Innovation District has an unmistakable energy and excitement that is almost palpable. And the continual sound of cranes working in the background signals that more is yet to come. The anchor for the city’s fledgling Innovation District is the Edney Innovation Center, which houses The Enterprise Center as well as open community spaces (including a rooftop hangout area) and a handful of other tenants. Located at the corner of 11th Street and Market Street, one might write off the Edney as just another old downtown building due to its cookie-cutter design and plain, beige exterior. But much like the district itself, the façade is a stark contrast to what lies inside. Walking through the sliding doors of the Edney, the first thing that comes into view is a large orange painted wall with the words “Thinkers. Starters. Doers” in bold, white letters. An apt example of those words is found just across the entryway in the first organization to locate in the Edney: The Company Lab (CO.LAB). 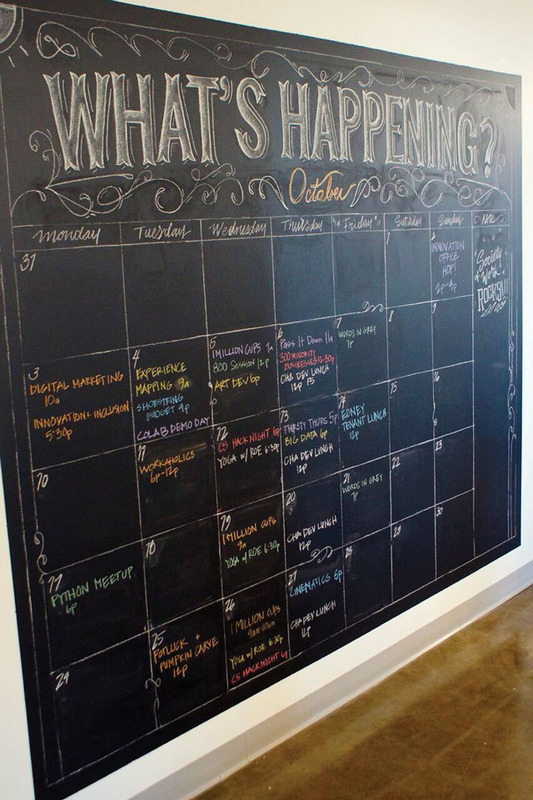 After five years of operation, CO.LAB moved into the Edney from its Southside Chattanooga location in September 2015. Executive Director Jack Studer says the designation of the Innovation District was a move that made sense for the city at a time when the innovation environment was beginning to expand. CO.LAB isn’t the only organization rallying around the flag. Inside the Edney, two other tenants are bringing the collaborative innovation concept off the drawing board and into the real world. 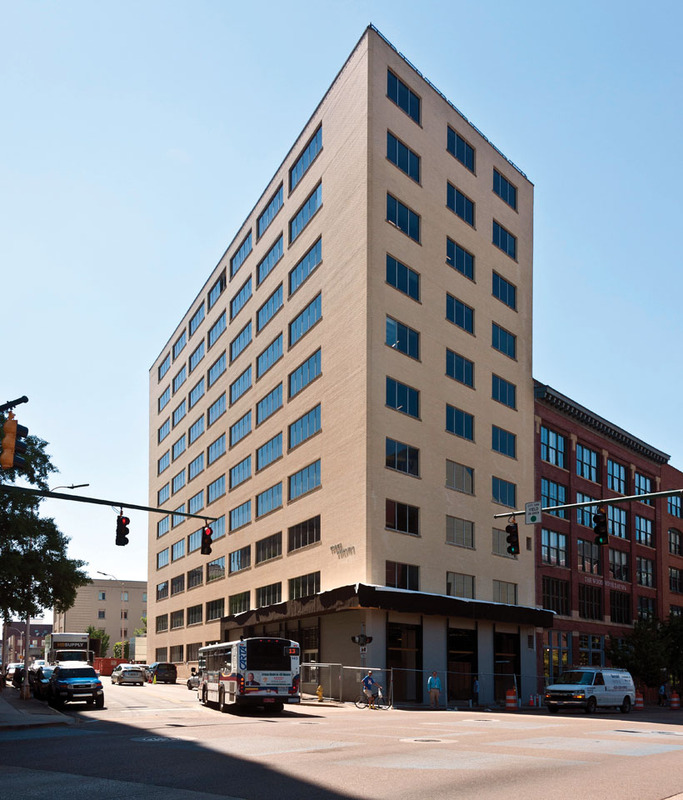 Located on the second floor, Techtown is home to STEM programming catered to Chattanooga’s youngest minds. Offering classes and summer camps inside the building, children ages 7 to 17 can learn about topics ranging from videography to robotics in a cool and collaborative learning environment. On the sixth floor, Society of Work is a membership-based shared office space where members benefit from all the perks of a private office with the advantage of being a part of a community of other go-getters. Outside of the Edney, a number of developments—many of them involving the revamping of historic buildings—are bringing the vision of the Innovation District closer and closer to the present. Advancing the concept of co-living, the Tomorrow Building is comprised of nearly 40 microapartments. The Fleetwood Building and 728 Market each present people with an exclusively pedestrian lifestyle option, offering living and office spaces in close proximity to dining and social venues, such as coffee shops, bars, and restaurants. Rounding out the new apartment options in the Innovation District is the Clemons, which opened in 2016 with 55 units. Seriously upping the hip factor in the Innovation District is the recent arrival of digital and social media company VaynerMedia, whose other branches are located in New York, Los Angeles, and San Francisco. With a diverse mix of recreational outlets, as well as living and working spaces, the Innovation District is an attractive magnet particularly for young people. And they are choosing to not only work in the Innovation District; they are living, socializing, and otherwise colliding with other talented minds within the high-density area. A visit to Chattanooga’s Innovation District in 2015 by Katz validated what the city was doing. Observing what he called “genuine, enthusiastic collaboration—not often seen in bigger cities” between public, private, and civic entities, Katz concluded that the usual model found in bustling metropolitans wasn’t necessarily the only path to a establishing a thriving Innovation District.